Hardscape paver patios, walkways, and driveways are great investments for any home or business. Whether it’s a new investment or an existing one, it’s important to protect and maintain it with sealants so that it lasts for years to come. When it comes to patio sealing, there are several key things to remember that will save you time and prevent mistakes. There are two types of sealers commonly used in the hardscape industry, water-based and solvent-based. 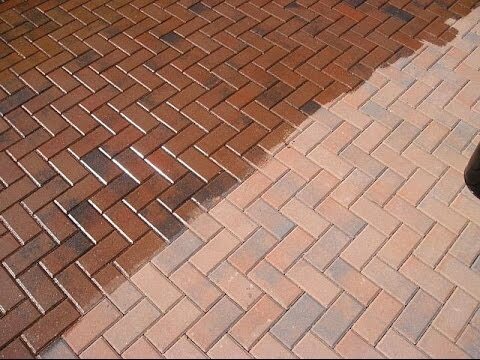 A water-based sealer will penetrate into the pavers and can last anywhere from 2 to 5 years, depending on the weathering the patio experiences. Solvent-based sealers create a film-like layer on top of the pavers and averages a lifespan of 2 to 3 years contingent on wear and tear. There are a variety of different sealer manufacturers, including Euclid Chemical, Prosoco, and SureBond, that offer both water-based and solvent-based sealers. Starting with a clean dry patio will make your life much easier when applying sealer. A solid 24 hours of dry weather, low humidity, and indirect sunlight on the patio is the ideal condition for the sealer to cure. Sealing in the morning or evening when the day is still warm and not hot will give you the best results. You can apply the sealer with a foam roller (like a paint roller) or use a professional lawn and garden sprayer. If you use a plastic sprayer it is important to note that a solvent-based sealer has a stronger chemical compound and may dissolve the gaskets in the sprayer. Patios both new and old benefit from regular sealing maintenance. When sealing a new patio, it is highly recommended to wait 6 months or longer before sealing to allow the pavers to dry and help to avoid efflorescence. Old patios should be thoroughly cleaned and dried before sealing. It is important to keep track of the type of sealer that was previously used on the patio pavers. If a solvent-based sealer was used, you must continue to maintain the patio with a solvent-based sealer, as the protective film layer will repel anything water soluble including water-based sealers. On the contrary, if a water-based sealant was originally used and you want to reseal with a solvent-based sealer, you may do so with little to no problems or complications. It is also important to check the website of the sealant manufacturer for best practices, instructions, how-to guides, and additional educational information when using their specific products. It is recommended to let the patio “breathe” and the natural aggregates in the pavers dry and adapt to the environment they are in. 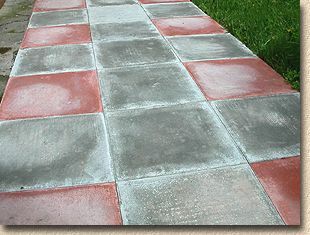 In time, the patio may develop a white haze....that is known as efflorescence. It is extremely important that you do not seal the patio while this is happening, as the white haze would then be sealed into the pavers and can be almost impossible to remove. If this does happen, there are some specifically designed cleaners that will help to remove any signs of the efflorescence. It’s best practice to wait 6 months to a year to seal the patio and allow the efflorescence to run its course and not cause any permanent damage. The time of year in which to seal a patio is also important. Avoid wet seasons, like Spring and Fall, as the moisture in the air can cause efflorescence to bloom. The warm summer months of June, July, and August are the best months to seal patio pavers. Knowing patio sealant best practices will help to protect and enhance the appearance of of your client's investment and help ensure it's beauty and durability for many years to come. It's the way we treat our customers that defines us. Since 1961, we have dedicated ourselves to providing customers with service beyond the showroom. Which means we pride ourselves on building relationships and partnerships with contractors so that we can better understand your needs and provide you with exceptional products and services to help your business grow and flourish.